Miranda Krestovnikoff presents the Arctic specialist the king eider duck. 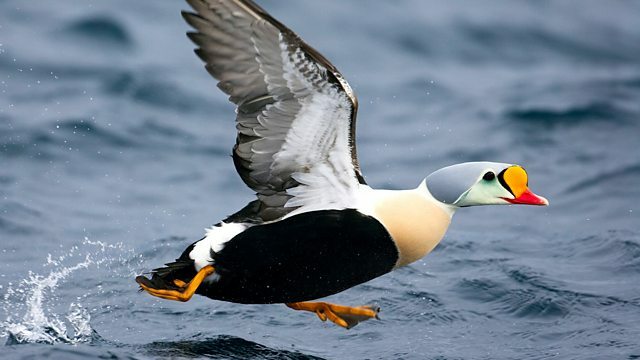 Relatives of the larger common eider found around the British coast, king eiders breed around the Arctic and sub-Arctic coasts of the northern hemisphere. As true marine ducks they can dive to depths of 25 metres on occasion, to feed on molluscs and marine crustaceans. The drake King Eider has colourful markings; having a black and white body with a reddish bill, surmounted by an orange-yellow shield. His cheeks are pale mint-green and his crown and nape are lavender-grey. He uses his bill pattern and head colours in a highly ritualised display to woo his mate, fluffing up his chest and issuing an amorous coo-ing call. Webpage image courtesy of Markus Versvuo / naturepl.com.